As thousands continue to stage violent protests in Turkey for 10 straight days, Prime Minister Tayyip Erdogan has refused to resign, blasting the protesters as “marginal” extremists. He also called on supporters to hold a pro-government rally. Riot police forcefully dispersed crowds of demonstrators in Istanbul and the Turkish capital of Ankara, where protesters gathered in front of the US Embassy to throw rocks and shoot fireworks at police. 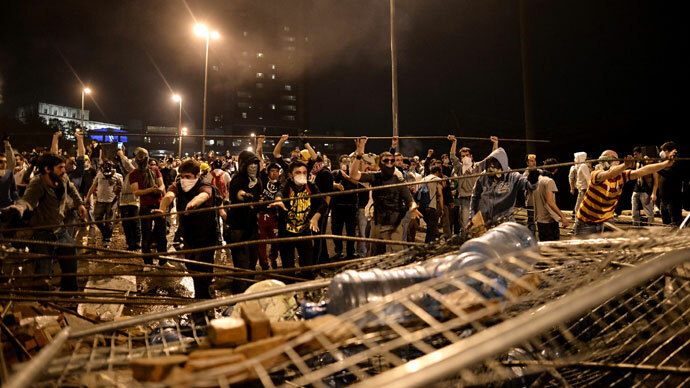 Numerous injuries were reported after riot police used teargas and water cannons, and beat back protesters with batons. 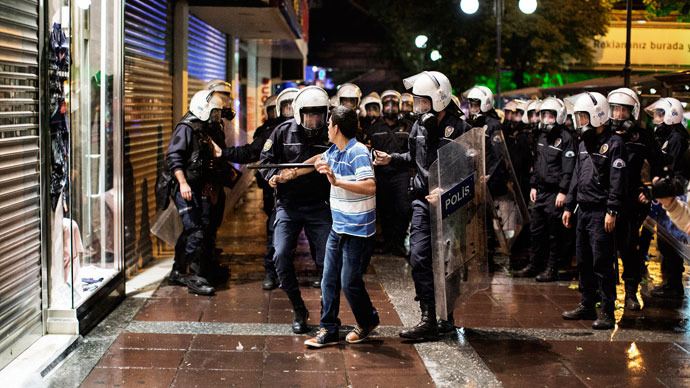 Clashes also erupted in the major western city of Izmir and the city of Adana in the south. 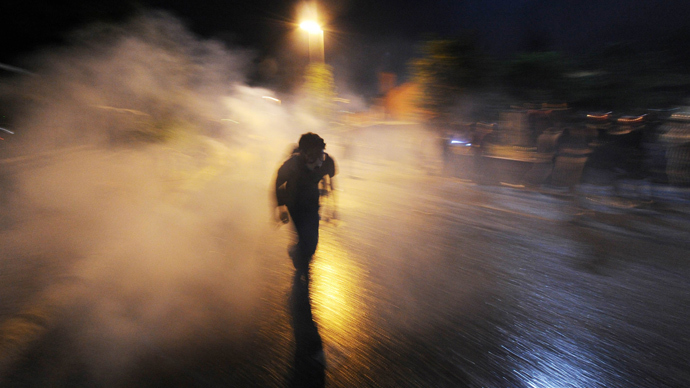 In Istanbul’s western Gazi neighborhood, rioters hurled projectiles and taunted police, AFP reported. Demonstrations calling for the resignation of Turkish Prime Minister Recep Tayyip Erdogan have been held in 78 cities across the country for 10 successive days. The mass protests have killed three and injured some 5,000 others. "Those who burn, those who destroy, and those who attack are called vandals. So, with all due respect, those who back them are in the same family,” he added. Reportedly, Erdogan described the protesters using the term ‘capulcu,’ which could be translated from Turkish as a slur for ‘hooligans,’ not ‘vandals.’ The protesters turned Erdogan's statement into a meme, printing ‘capulcu’ on stickers and uploading music videos onto the Internet. Following Erdogan’s speech, more demonstrators massed in Istanbul's Taksim Square and Ankara's central square. "We understand from his words that he does not want to have an agreement with us, all he demands is to make us accept his rules. 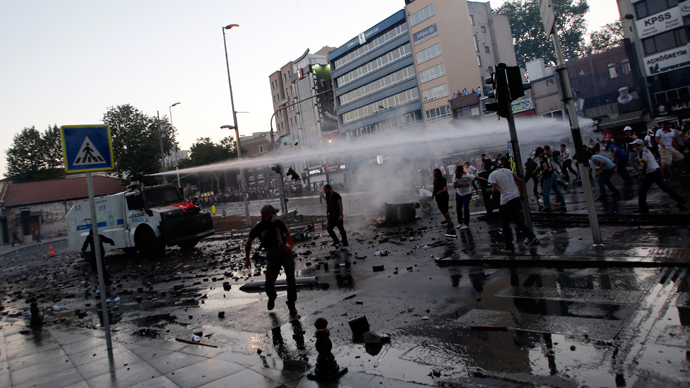 Unless he tries to compromise, we will not give up," Istanbul protester Gulsah Kocyigit told AP. “There are just seven months left until the local elections. I want you to teach them a lesson through democratic means at the ballot box,” Erdogan told a cheering crowd. 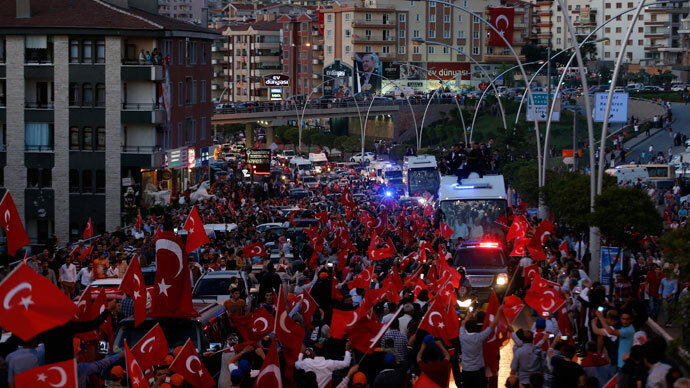 The Turkish PM often refers to the 50-percent majority he received in the last elections in 2011 to portray the ongoing protests as a minority riot, claiming his supporters make up the majority of voters. "We were patient, we will be patient, but there is an end to patience, and those who play politics by hiding behind the protesters should first learn what politics means," Erdogan said. Protesters have accused Erdogan of becoming authoritarian during his 10 years in power and attempting to impose the Islamization of Turkey, which is currently governed by secular laws. Erdogan brushed off the accusations, calling himself a "servant" of his people. Istanbul's Taksim Square, where the main protests are taking place, is a very important symbol for Turks, the professor explained. Built in the 1920s, Taksim Square symbolizes the modern secular Turkish Republic. “Erdogan wants to turn it [Taksim Square] into symbol of something else. He wants to put up military barracks and a mosque there to totally change the face of Taksim Square to represent what he wants Turkey to become – which is a religious society,” Salt concluded.